Raspberries can be used in a variety of appealing and delicious ways. Freshly prepared and sugared raspberries are excellent when either served alone (Figure 1) or used to make a raspberry sundae. The fruit can also be used to make delicious jams, jellies, pies and other desserts. Besides their excellent flavor, raspberries are a nutritious food, contributing vitamins A and C and various minerals to the diet. Making a raspberry smoothie is a delicious treat and a nutritious way to enjoy this wonderful group of berries. Numerous studies have shown that raspberries are very rich in antioxidants and have anti-cancer properties. Raspberry plants can also be easily incorporated into being a part of any edible landscape. Shown here is a black raspberry hedge at Longwood Gardens, Kennett Square, Pennsylvania (Figure 2). Healthy red raspberry stems are reddish-brown while black raspberry stems are greyish-white, and can add interest to the winter landscape. Figure 1. Fresh red raspberries. Photo by Ken Chamberlain. Figure 2. A black raspberry hedge. Photo by Gary Gao. In Ohio, raspberries ripen shortly after strawberries that are grown in a matted row system. Raspberries make an excellent fruit crop for both summer and fall harvests, depending upon which cultivars are selected. At least two years are required to establish a raspberry planting, but once established, the planting can remain productive for many years if given the proper care. Many garden centers often carry container-grown raspberry plants in 1-gallon or larger pots. If these containerized plants are two years old, they can produce a crop in their first year of planting. Figure 3. Ripening black raspberries. Photo by Ken Chamberlain. All raspberries, which are also known as brambles, are most often classified by either fruit color and/or fruiting habit. They are most often categorized as red, black, purple or yellow-fruited types. The black raspberry is the most popular bramble grown in Ohio (Figure 3). The second most popular raspberry is the red type. The red raspberry is the first bramble to ripen in the summer, followed by the black, purple and yellow cultivars. When compared with black raspberries, red raspberries tend to be more cold-hardy, have larger berries and produce more erect (upright) canes. Black raspberries are less cold hardy than reds, yet bear smaller, seedier and more aromatic berries with arching to drooping canes. Purple raspberries are hybrids of red and black raspberries and their growth habit is similar to that of the black raspberries. Most yellow raspberries are similar to red raspberries in growth habit. Raspberries may also be classified as summer-bearing or everbearing. Summer-bearing cultivars produce one crop in early summer, while everbearing cultivars can produce crops at two different times a year, with a crop being produced either in early summer or a later crop in mid-fall. Most everbearing raspberries are the red or yellow-fruiting types. Cultivars suggested for planting in Ohio gardens are listed in Table 1. Summer Black Raspberries Bristol Early Large and attractive fruit that is firm and has good flavor. Plants are vigorous and productive. Hault Early Medium-sized fruit with good flavor. Plants are vigorous and productive. Allen Early-Mid Large and attractive fruit with mild flavor. Plants are vigorous and productive. Jewel Early-Mid Long and attractive fruit with good flavor. Plants are vigorous and productive. Mac Black Mid-Late Probably the latest-producing cultivar. Attractive fruit with good quality. Plants are productive. Black Hawk Late Medium to large fruit with good quality and flavor. Plants are vigorous, productive, and resistant to anthracnose. Summer Red Raspberries Prelude Very Early Good quality fruit. Plants are productive and very winter hardy. Prelude is also fall-bearing but produces most of its crop in spring. Reveile Early Medium to large fruit with good flavor. Vigorous and high yielding. Boyne Early Deep-red, medium-sized fruit with good flavor and production. Very winter hardy. Killarney Early Large, firm berries with good flavor. Very winter hardy. Nova Early-Mid Berries are firm, bright, and medium to large in size with good flavor and shelf life. Good producer and very winter hardy. Titan Early-Mid Largest fruit size of any red raspberry. Very attractive fruit with good quality. Moderately susceptible to Phytophthora root rot. Liberty Mid Medium to large fruit with good flavor and freezing quality. Plants are productive. Latham Mid Small fruit with good color and fair flavor. Moderately productive. Very cold hardy. Newburgh Mid Medium-sized fruit with good flavor. Moderately productive. Cold hardy. Sentry Mid Bright red, firm, and medium-sized fruit with good flavor. Productive with fair winter hardiness. Encore Mid-Late Large, good quality fruit. Plants are productive with good winter hardiness. Summer Purple Raspberries Brandywine Late Large, reddish and tart fruits that are good for jellies and jams. More vigorous and productive than most black raspberries. Royalty Late Large and reddish fruits that are sweet and flavorful when eaten fresh. Plants are vigorous and productive. Everbearing Red Raspberries Polana Early Ripens three weeks before Heritage. Very productive with large, flavorful fruit. Autumn Britten Early-Late Very large, firm, and flavorful fruit. Ripens before Heritage. Caroline Early-Late Very large and flavorful fruit. Very productive. Widely adapted cultivar. Heritage Mid-Late Medium-sized fruits with good color and flavor, firmness, and freezing quality. High yielding. Redwing Mid Large and soft fruits with good flavor. Moderately productive. Everbearing Yellow Raspberries Fall Gold Early Medium-sized and soft fruits with excellent flavor. Moderately yielding. Anne Mid-Late Largest and best-lasting yellow raspberry. Ripens the same time as Heritage. Can be pruned for summer production or mowed for full production. Raspberries will grow and produce excellent quality fruit on many different types of soil; however, they will be most productive on sandy loam soils that contain organic matter and plant nutrients. The soil should be well-drained and have a pH between 5.8 and 6.5. Always have the soil tested to determine soil pH and nutrient levels. Add all of the lime or sulfur to adjust soil pH and then add any necessary nutrients according to soil test recommendations. 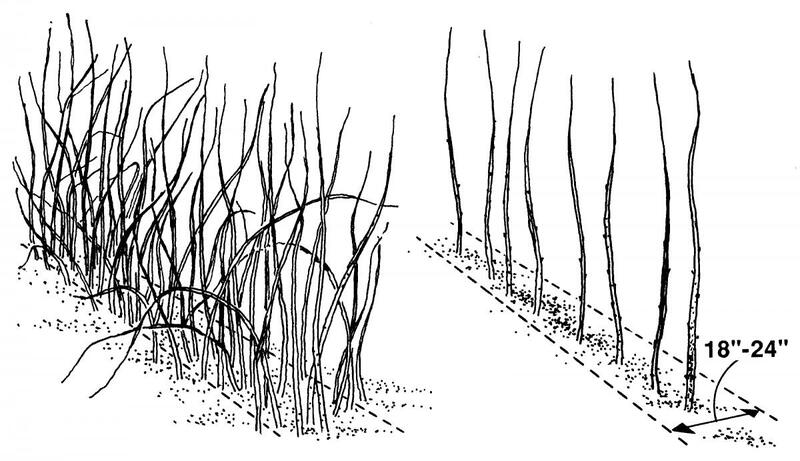 Plant raspberry bushes on ridges or in raised beds (Figure 4) because brambles prefer well-drained soils. Most cultivars of brambles are susceptible to root rot diseases. Hence, it is very important to plant them in raised beds for healthy root development, plant growth and abundant berry production. Raspberries should be planted in an open site that receives at least 6 to 8 hours of sunlight and placing them in areas with a day-long exposure is even better. Avoid planting raspberries within 300 feet of any wild blackberry or wild raspberry plants, and in areas where tomatoes, potatoes or eggplants have been grown in the previous year. Figure 4. 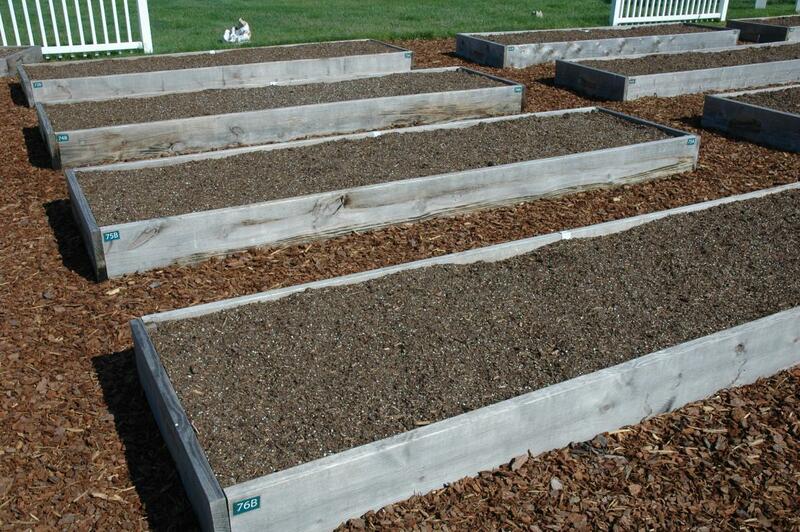 Raspberry bushes should be planted in raised beds such as these shown here. Photo by Gary Gao. Do not plant black or purple raspberries near red raspberries, even though the red raspberries appear to be healthy. Red raspberries may have latent infections. This means that they can be infected, but do not show symptoms. Even though infected plants appear symptomless, the virus can still be transmitted from them to healthy plants. If black and red raspberries are planted together, separate them as far apart as possible. If possible, plant black raspberries upwind from reds. The reason for this is the aphids, which transmit plant viruses, are generally blown or carried by wind currents, rather than by active flight. Therefore, you do not want aphids to be blown from a red raspberry planting to the more susceptible black raspberries. Early spring planting is preferred over fall planting. Plant as soon as the soil can be properly prepared. The plants can be established either in hedgerows or using the hill system depending on the types of raspberries (Table 2). Also, refer to Table 2 for recommended training systems and spacing. Planting too closely results in undesirable competition, while planting too far apart wastes space. Mechanical removal of weeds is highly recommended. A mulch of straw, sawdust or other appropriate material can be very helpful for weed control, and to conserve soil moisture in raspberry plantings where soils are well drained. If soils are too heavy in texture and retain too much moisture, it may not be a good practice to mulch raspberry plants. Mulching can increase or aggravate Phytophthora root rot and/or Verticillium wilt of raspberries planted in poorly drained soils. In any case, either mechanical or chemical cultivation is preferred to maintain a weed-free planting bed. Fertilizer and/or lime applications are best adjusted by following the recommendations, which are based on the soil test results. Contact your local Extension office for instructions on soil sampling and testing. Soil fertility should be maintained by two applications of 1 pound of a 10-10-10 fertilizer or the equivalent per 100 feet of row at 10 days after planting and then again 40 days later. For the years following planting, raspberry plants need to be fertilized about twice each year. The fertilizer should be broadcast in the row between plants, starting in the spring before growth begins in March (southern Ohio) or April (northern Ohio), and then again in May (southern Ohio) or mid- to late May (northern Ohio). Apply 2 to 3 pounds of a 10-10-10 fertilizer per 100 feet of row in each application. Figure 5. The diagram of a raspberry plant. 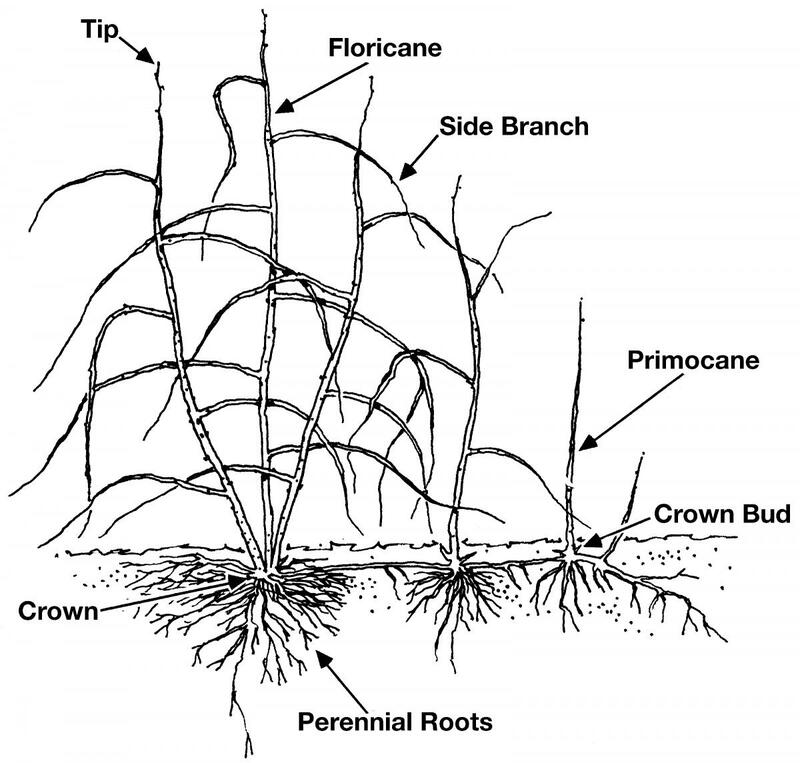 It is very important to understand the terms used to describe various parts of a raspberry plant before attempting to prune raspberries (Figure 5). Raspberry canes are best described and identified using two different terms; specifically, primocanes and floricanes. Primocanes are first year canes, characterized by rapid growth and expansion from the crown of the plant or ground nearby, while floricanes are second-year fruiting canes. Summer red raspberries should be pruned twice a year, first in the spring and immediately after harvest. 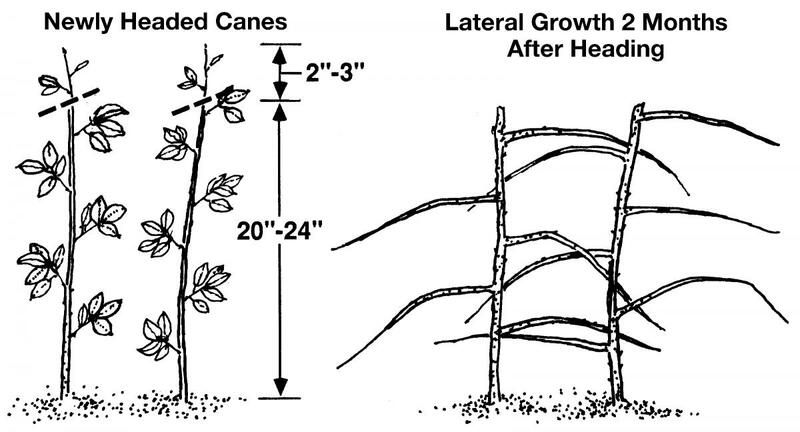 The spring pruning, in late March or early April, consists of removing all weak canes and cutting back tall canes (over 5 feet) to 4.5 to 5 feet. The second pruning consists of the removal of canes that produced fruits, right after harvest. Everbearing red raspberries such as "Heritage" raspberry can be pruned to produce fruit once a year or twice a year. 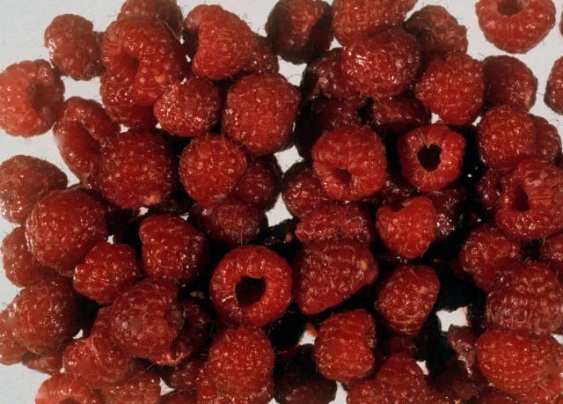 If you thin floricanes to about 5 inches between canes in March and maintain all canes in an 18 to 24 inch strip, "Heritage"-type raspberries will bear fruit on the older floricanes in early summer and then in the fall, the newly grown "fruiting primocanes" may also produce fruit (Figure 6). However, many home gardeners and commercial growers mow or cut all "Heritage" canes to the ground in early spring (March or April) for the sake of simplicity. "Heritage" raspberries pruned this way will produce only one crop starting in early August in southern Ohio, and mid-August in central Ohio. Everbearing raspberries can produce fruits until frost. Black and purple raspberries are pruned three times a year: in the spring, summer and after fruiting (Figure 7). Primarily, pruning is done in spring when lateral branches are cut back to approximately 8 to 10 inches in length in mid-March. The second time to prune is called "tipping" or "heading back" of the new canes or primocanes. When grown without a support structure, summer tipping is done when black raspberry canes reach 24 inches in height and when purple types reach 30 inches. Tipping is done by removing the top 2 to 3 inches of new shoots as they develop. The third pruning event involves the removal of all of the floricanes that have finished producing fruit. Figure 6. Everbearing red or yellow raspberries before and after pruning using a cane thinning method. Figure 7. Black and purple raspberries before and after pruning. The principal insects of raspberries are the raspberry cane borer, raspberry fruitworm, red-necked cane borer and Japanese beetle. The common diseases on raspberries are mosaic virus, orange rust, anthracnose, cane blight, spur blight, crown or cane gall, and Verticillium wilt. Figure 8. Trellis for raspberries. A wire trellis can help make the raspberry crop easier to manage and keep the canes off the ground so that berries are cleaner and easier to pick. A trellis can be constructed with posts at 15 to 20 foot intervals with cross arms to support wires placed 24 to 28 inches apart (Figure 8). The wires should be placed about 36 inches in height off the ground for red raspberries and 40 inches in height for the black and purple types. Raspberries can be successfully grown for many years in home gardens. Raspberry plants grow best in raised beds or areas with excellent water drainage. Water the plants about every two to three days depending on fruit load and weather conditions. Pruning must be done every year. 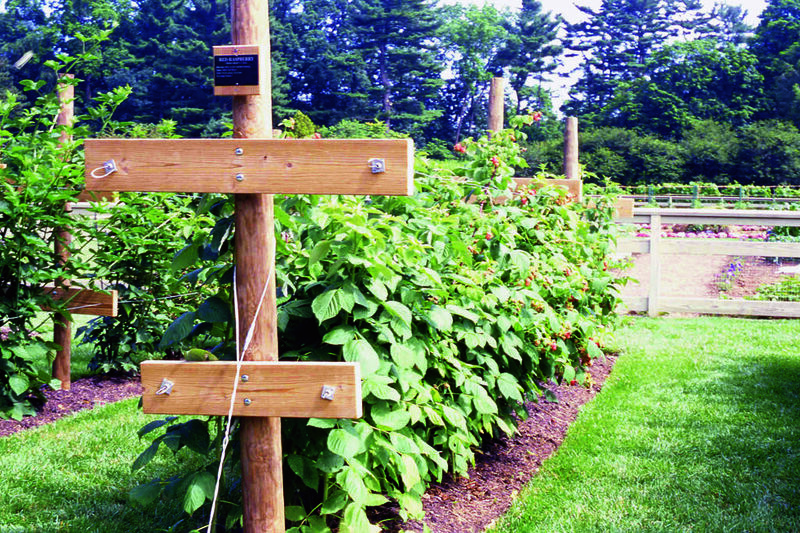 For additional information about growing raspberries, purchase a copy of the OSU Extension Bulletin 940, Midwest Home Fruit Production Guide, or Bulletin 783, Brambles, Production, Management and Marketing; or Bulletin 780, Controlling Diseases and Insects in Home Fruit Plantings from your local Extension office in Ohio. These bulletins can also be ordered through OSU Extension’s eStore at estore.osu-extension.org. Bushway, L., M. Pritts, and D. Handley, Editors. NRAES-35, Raspberry and Blackberry Production Guide for the Northeast, Midwest, and Eastern Canada. Ithaca, NY: Northeast Regional Agricultural and Engineering Service. Ellis, M. A., and C. Welty. 2010. Ohio State University Extension Bulletin 780, Controlling Disease and Insects in Home Fruit Plantings. Columbus, OH: The Ohio State University. Funt, R., M. Ellis, R. Williams, D. Doohan, J. Scheerens, and C. Welty. 1999. Ohio State University Extension Bulletin 436, Brambles: Production, Management, and Marketing. Columbus, OH: The Ohio State University.